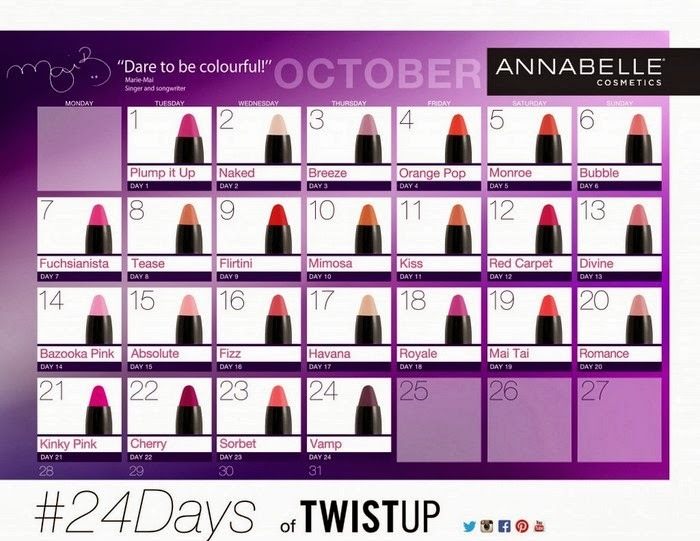 To celebrate the launch of of tweleve new shades of TwistUp Retractable Lipstick Crayon, Annabelle is initiating #24Days, aka the 24 Days of TwistUp, as of October 1st. This past Tuesday the brand hosted an amazing flash sale where you could grab all 24 shades for 24$. That’s 1$ for each amazing TwistUp ya’ll! The sale had so much response that it overwhelmed the website, and Annabelle being the amazing company that they are decided to make it up to us and extend the offer by giving us the possibility to sign-up and get another shot at the deal. You can do so here. 150 registrants will randomly be selected and given a promotional code, enabling them to purchase their 24 Annabelle TwistUp for $24.